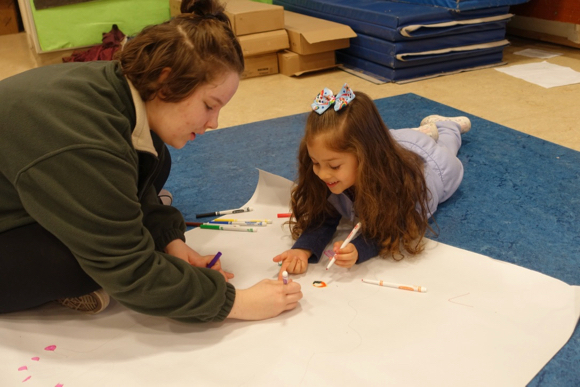 Hillview Middle School art teacher Anna Kogan took her students across town on a field trip to visit the three through five-year-olds at the district’s Early Learning Center for a special joint art project. 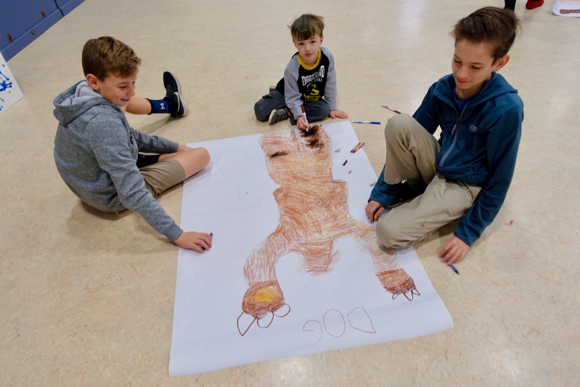 The preschoolers used their whole bodies to pose as their favorite animal while the middle school artists traced them. Together, the district’s youngest and oldest students then colored with markers, colored pencils, and oil pastels to make the traced figures look like the animals. 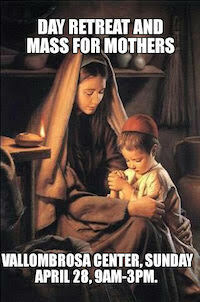 The field trip was not the first cross-district art collaboration. Last summer, as the ELC was being readied for opening, each ELC child decorated a sea animal (octopus, sea horse, shark, dolphin, whale) with paint, glitter, and sequins. Hillview students assisted with the background painting, and now the large sea life mural graces the ELC’s entrance courtyard.